We all know that Colorado is a wonderful place to live, work, and raise a family. And we all want to keep it that way so that our kids and grandkids will be able to afford to live in the same neighborhoods, breath the same clean air, and explore the same beautiful mountains. Though things in Washington DC feel uncertain, here in Colorado we’ve done a pretty good job protecting the things that are most important and planning for the future. But we have a lot more work to do to make sure every hard-working Coloradan can thrive and enjoy the Colorado way of life. 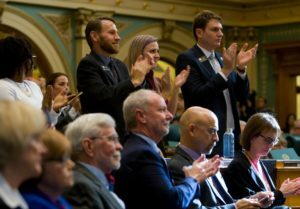 In November 2018, Colorado voters elected Democratic majorities in both the House and Senate and a Democratic governor. For me, this means a few things. First, voters chose candidates who committed to taking action to grow the middle class, invest in public education, expand access to affordable health care, and protect the environment. They chose a government that is proactive and thoughtful about solving problems and planning ahead for the future. Now, we are going to do what they elected us to do. Second, many of the good ideas that died over the last few years in the GOP-controlled Senate will have a great chance of passing into law. The list includes paid family leave, increased transparency for hospital and pharmaceutical costs, new protections for the LGBTQ community, increased investment in affordable housing, acceleration in the transition from fossil fuels to renewable energy, and common-sense gun violence prevention laws. Third, our work to build bridges across the aisle has a different kind significance. While Democrats may not technically need bipartisan support to pass bills, those of us who served in a divided legislature have learned how much can be gained by seeking to understand different perspectives. In every conversation I’ve had with my new and returning colleagues, I have observed a strong desire to find bipartisan solutions wherever possible. And when you actually try, you find it’s possible a lot more often than some might think. So what all will we be working on? Well, at the legislature, we all lead in some areas and play supporting roles in others. Here are a few areas where I’ll be devoting much of my energy. I believe health care is a human right. We must continue to build on the progress of the past several years to reduce costs and expand access to affordable health care for all Coloradans. To reduce costs, we must start by increasing transparency, curbing outrageous billing practices, and reforming insurance markets to address some of the highest cost risk pools and regions. From there, we must focus our energies on the transition from fee-for-service “sick care” to a health care system that pays providers for value, not volume. We have also seen a major public health issue growing over the last few years – teen vaping. We know that the vast majority of smokers who are addicted got started smoking as teenagers. We also know that our too many retailers are still selling products to minors. We need to take steps to make sure our smoking laws are modernized to include vaping and to hold retailers accountable to following the law. The rapid growth in the Denver metro area has made it too difficult for too many Coloradans to afford to buy a home or even to rent and apartment. We must tighten up our renters’ rights laws and partner with our cities and counties to increase the availability of affordable homes, townhomes, condos, and apartments. And we must do it in a sustainable way through a prioritization of transit-oriented development. By building mixed-use residential/commercial communities near light rail stations and bus routes, we can make it possible for people to live and work without needing to take a car everywhere they go. I have also been focused on senior housing. In 2000, voters established the Senior Property Tax Exemption to help seniors afford their property taxes and stay in their homes. Unfortunately, the program is not working as well as it could be. It doesn’t give enough help to low-to-middle income seniors, and the ten-year residency requirement discourages seniors from downsizing. Furthermore, the growing cost has made the program vulnerable to cuts during recessions. I have been working on a plan to restructure the program to focus our limited resources on giving more help to senior owners and renters who need help the most, and to make sure the program is around for the long run. Climate change is a real threat to our way of life. The carbon pollution we’re putting into the atmosphere is heating the planet and increasing the frequency and severity of wildfires, droughts, and hurricanes. Colorado has long been a leader on renewable energy, and our early investments have made wind and solar so competitive that Xcel is implementing their own plan to get to 100% renewable without needing to increase utility bills. Now is the time for us to take the next big steps. That means helping the rest of the state catch up by creating processes to close coal plans while providing a just transition for the works, modernizing our grid, and building out an infrastructure for charging electric vehicles. We must also pay special attention to the communities impacted by oil and gas development. I support increasing setbacks from schools and neighborhoods, funding more inspectors to enforce our methane regulations, and ensuring that the regulators have a clear mission to protect the health and safety of our communities. While I’m thrilled that Jeffco voters passed 5A and 5B last year, we are still funding our schools far below the national average. The teacher shortage continues to be a major challenge, and too many districts across Colorado are still on four-day weeks. We must continue working to build support for reforming TABOR and Gallagher so that we can invest adequately in K-12 and higher education in Colorado. I also support increasing our investment in early childhood education and full-day kindergarten. Education has always been the key to a thriving middle class. As the Chair of the State Affairs committee, I’ll be playing a major role in updating our elections laws. While the 2013 law that gave us universal mail ballots and same day voter registration is working pretty well, there are some adjustments we can make so that it works even better. We are also moving forward with automatic voter registration, a program to register eligible voters when they enroll in other state programs. Lastly, I have begun conversations with our incoming Secretary of State, Jena Griswold, about some ideas around dark money in campaigns. While our hands are somewhat tied by the Citizens United decision, there are steps we can take to beef up disclosure requirements to make sure the funders of these dark, negative campaigns are known to the public. I will be eager to support the work of my colleagues on many other issues including affordable child care, criminal justice reform, transgender rights, transportation funding, equal pay for equal work, paid family leave, gun violence prevention, immigration, and gun violence prevention. We have an incredible opportunity over these next two years to show Colorado voters what can be done with a government focused on expanding opportunities for everyone who works hard and does their fare share. We must be thoughtful about the consequences of our policies and we must take bold steps forward to protect the things that make Colorado such a special place to live. I’m so excited to be back in session and working on these policies again. Contact my office to share your priorities at chris.kennedy.house@state.co.us or 303-866-2951.